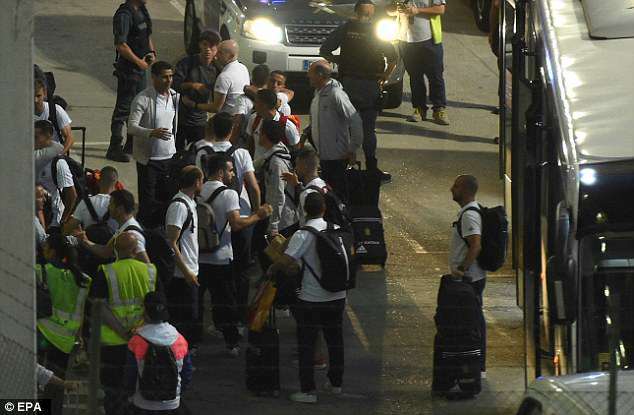 A disappointed Spain squad touched down in Madrid on Monday evening as they were consoled by family and friends following their elimination from the World Cup. Goalkeeper David de Gea cut a forlorn figure, as did manager Fernando Hierro, as the country try to come to terms with their shock exit to hosts Russia on penalties. The 2010 champions preparations were thrown into turmoil on the eve of the tournament with the dismissal of boss Julen Lopetegui and despite winning Group B, they never found form many know they are capable of. Players swiftly took to their social media after the exit to apologise to supporters for the unexpected exit. Defender Sergio Ramos finished his letter to supporters with: ‘If you want to think about failure, you are free to do so. We prefer to think that it is a new opportunity to cry, to learn, to get up, to grow and to continue struggling. We will do it, that’s for sure. With the fall of Germany in the group stage, it appeared that Spain had a relatively straightforward route to the final as they fell in the kinder half of the draw. But Sergei Ignashevich’s early own goal was cancelled out by Artem Dzyuba minutes before the interval and the hosts resiliency was evident for all to see as they forced a penalty shootout. Russia converted their first four penalties and did not need to take a fifth as Koke and Iago Aspas both saw penalties saved by Igor Akinfeev to send the host nation into delirium. It marked the end of Andres Iniesta’s international career and others such as 32-year-old David Silva and 31-year-old Gerard Pique are now expected to consider their futures ahead of Euro 2020 qualification. But while stars weigh up whether to commit for the next major tournament, it is unlikely boss Hierro will be afforded the same luxury as fans unanimously want a change moving forward. A MARCA poll has former Barcelona boss Luis Enrique as the leading candidate wit many believing Hierro lacks the experience as a top-level manager.